The week before last was week 17 of The Plan, and a big week it was too! It started with another ramp test and with it another bump in my functional threshold power (FTP) - a 5% increase to 271W. I’m starting to get in genuinely good shape now! At the end of the week, I had my second event of the year, the Cotswold Cyclo by Hammer Sports, which was 143km around the Cotswolds. This was another “race”. I finished 8th of 55 in just under 5 hours and 20 minutes. The course was rolling with a few substantial climbs, the largest of which were Foxcote Hill out of Ilmington and Campden Lane out of Winchcombe. The latter is an absolute brute, averaging 9% for 2.1km with a 600m section averaging 13% and maxing out at 25%! 400W at 45 rpm is not fun, but is probably representative of what I’ll face at my target event, The Fred Whitton Challenge in May. I’m sure you’re all dying to know how the race played out! Well, it was less exciting than my previous race. After a sedate start, I was sitting comfortably in the main group for the first hour or so, with a few other guys up the road. I dropped the group on the first big descent. Not deliberately, but when I looked round at the bottom there was nobody there so I cracked on! Aside from the massive headwind, the next couple of hours were fairly uneventful - a few from the main group behind caught me, and we caught and dropped of few of the riders ahead of us. It was down to three by the time we reached Campden Lane, the major climb of the day. I was straight off the back! I really put the hammer down once we got to flatter roads but couldn’t get back on, so I had a lonely final 50km! I can hold tempo/sweet spot for a long time. My normalised power was only 10W lower than my previous race (240W vs 250W a few weeks ago) for over two hours longer! This is around 80% of my outdoor FTP, which I’m estimating at 290W (there are lots of reasons why this is not the same as my indoor FTP). I can stomach a lot of food during this kind of event. I was more-or-less eating every 20 minutes for the whole event, getting over 80g of carbohydrate per hour. This is likely why I can hold a strong effort for long durations. My effort was reasonably consistent. My normalised power was 255W for the first half and 224W for the second. Most of this difference is probably explained by the massive headwind on the way out, more climbing, and being in a group for the first hour. I’m pretty good a descending. I was in a big group of around 20 for the first hour, but I dropped them all on the first big descent with only a few getting back on later in the day. This is probably a combination of unjustified confidence and being too heavy! 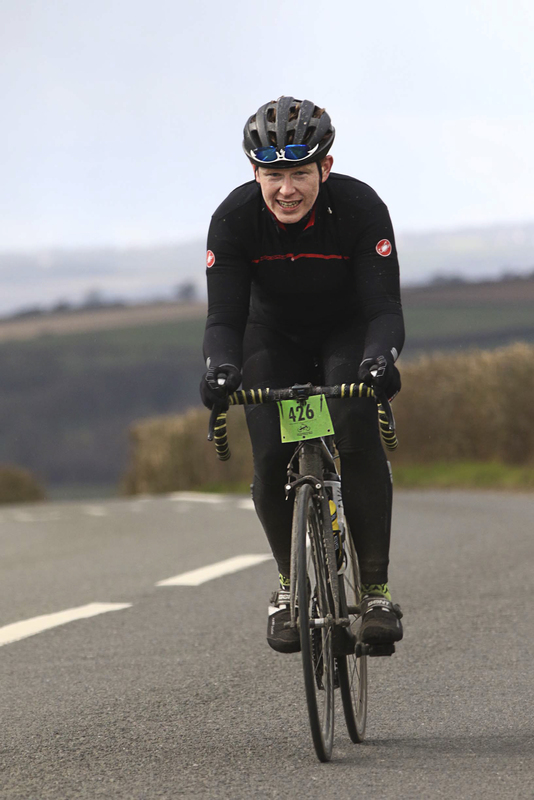 I really need a smaller gear for Fred Whitton. My lowest gear is currently a 36x32 but, as Campden Lane showed, that just doesn’t cut it for long ascents over 15%. I’m going to be switching out my current gearing for compact chainrings and a 34 cog at the back, giving me a 34x34. This is the smallest gear I can fit on my road bike without resorting to a triple chainset. Hopefully, that will be enough! I struggle to sustain efforts just above threshold for extended periods (over five minutes). This was really highlighted in my other hard session of the week - 5 sets of 7 minutes at 105% FTP with 3 minutes recovery. This was the hardest workout I’ve done in years, perhaps ever. Two minutes into the first interval I was convinced I’d have to bail, but I didn’t! I’ll be doing a lot more of these sessions over the next eight weeks. Joy! I need a stronger core. My lower back and triceps were really struggling for the last hour or so of the race. I’ll be spending much more time in the gym over the next couple of months. While I definitely ate enough to keep me going, I got serious sugar fatigue. Towards the end, I was just craving plain water. For Fred Whitton, and longer rides, in general, I’m going to bring a greater variety of food other than gels and flapjacks. I didn’t find cycling for that duration non-stop particularly comfortable. While my training thus far has developed my aerobic capabilities well without the need for especially long rides, it hasn’t developed my muscular resilience. As a result, my legs suffered for days afterwards and I pulled a muscle around my knee during a recovery ride the following day. This doesn’t seem to have set me back too much. I had five days off the bike, and all seems fine now. Well, firstly, I’m spending this week building back into hard training after my knee trouble. Then next week it’s back on it, with a five-week block of hard training followed by an easy week leading into Fred Whitton. I’ll be addressing the limiters I mentioned above - lots of supra-threshold intervals and hopefully dropping a few kilos - and may do the occasional time trial.